Vintage Pair of Peerless Handcuffs. Circa 1930's and made by The Peerless Handcuff Company, Springfield, Mass. It has a blued coating. 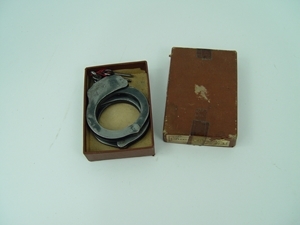 The handcuffs are in their original box along with 2 keys and are in good condition.